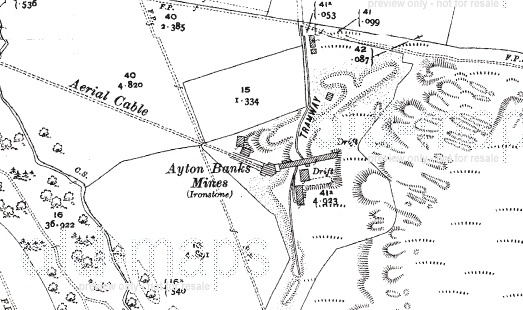 I’ve previously posted photos of Ayton Banks when it was heavily overgrown. The foundations of the terminal of the ropeway have since been cleared of brambles and weeds and are now much more visible. The ends of two steel ropes from the ropeway can still be seen anchored into the concrete. Absolutely, a huge amount is already gone, but we do what we can to protect what remains. Well done Chris! I find the ironstone mining history of our area fascinating – your work on the website is a great source of information. Keep it up! As I recall, there’s a photo of an aerial ropeway in the Foundry pub on Eston High St. There are a number of others of Eston ironstone mines and I was wondering whereabouts the ropeway was. Has anybody else seen this photo and could it be part of the Great Ayton ropeway? My grandfather used to manage and run the big buckets on the ropeways as he started as a boy working in the mines as my great grand father also worked there and he was a tin miner down south before he worked in the great Ayton mines.